Blackbelly Skatepark is a multiplayer stage in Splatoon and Splatoon 2. Blackbelly Skatepark is a stage based around a skate park. It includes a curved landscape with multiple raised locations. Blackbelly Skatepark features two inversely symmetrical skateparks with large ramps and hills. It also includes more widely open areas. There are numerous ways to attack the center of the map, as well as to attack the bases. In the center, there is a central tower. It is a large, plateaued structure that can only be accessed by climbing vertical paths of Ink. It is an effective but vulnerable place to control the center area of the stage. Small balconies are positioned on its sides. Right alleys are located to the right of each teams' spawns and lead towards the center of the map. They each contain a high platform which can be useful for chargers trying to take over the Central Tower. There are no hazards in Blackbelly Skatepark. In Splatoon 2, the spawn point area is now not accessible to the enemy team, now being on a fairly large raised platform area. Topside view of Blackbelly Skatepark. 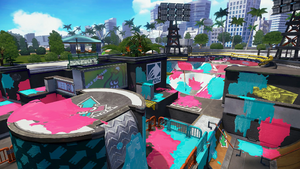 The Splat Zones in Blackbelly Skatepark are relatively small and located in opposite corners from each other in the middle of the map, both touching the Central Tower. The tower in Blackbelly Skatepark is located at the top of the Central Tower. The goals are located in the Right Alleys, going past the two small walls. When it is ridden, the tower will go to the riding team's left. The tower will then descend downward and proceed to go through the opposing team's Right Alley, all the way to the goal. The first checkpoint is located on the slightly raised area directly to the left of the tower. The second checkpoint is located between the two roadblocks in the enemy's half pipe. The Rainmaker in Blackbelly Skatepark is located at the top of the Central Tower. The Goals are located directly to the left just off of spawn. Just past those goals right by the Central Tower there are black un-inkable boxes. There are also small boxes added to the Central Tower so players are able to hit the Rainmaker weapon with out being pushed down from the expanding shield. The basket is located at the right side from spawn infront of the hills. There isn't any bump near it. The layout looks the same as in Turf War. Blackbelly Skatepark underwent a series of changes between its development period and release. Stairs leading from Spawn Points to the Central Tower were present. There were more wooden ramps near the middle area. Near the middle area, four bumpers could be found. The entrance to the middle of the map from the left of both teams' respawn point wasn't present. The pre-release version of Blackbelly Skatepark. Another shot of a pre-release Blackbelly Skatepark, the outer city and barriers are different. An Inkling flinging ink with the Dynamo Roller at an early version of Blackbelly Skatepark. 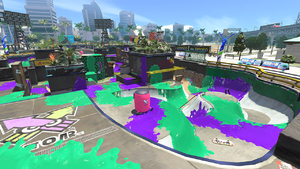 Blackbelly Skatepark was released with launch of Splatoon. A male Inkling pushing an Inkbrush at Blackbelly Skatepark. Inklings playing Tower Control at Blackbelly Skatepark. A female Inkling holding a Splat Charger on the central tower. An Inkling Super Jumping over Blackbelly Skatepark as a Kraken. The park outside of Blackbelly Skatepark. The city buildings behind Blackbelly Skatepark. Basketball courts outside Blackbelly Skatepark. Blackbelly Skatepark was released on 28 October 2017 at 02:00 UTC. 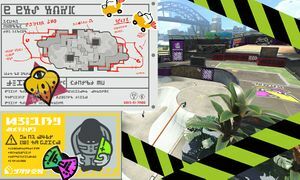 Blackbelly Skatepark returns in Splatoon 2, appearing nearly identical to its appearance in Splatoon, with a few notable changes. The platform the spawn point is located on no longer slopes downwards to the area ahead of it, and the platform has been stretched backwards to allow for more room. The square platform in front of spawn now also extends forwards, allowing for an additional side-route to the center. A small bump on the right side of the stage also has been removed. As a result of these changes, the stage is now more large and open than its appearance in the first game. The image released on social media announcing changes to Blackbelly Skatepark. A female Inkling standing in front of stickers of Brands on the walls. An Inkbrush flinging ink from the center tower. Blackbelly Skatepark's name is a reference to the real-life blackbelly skate, a species of ray. Evening and night variants of this stage are used in Octo Valley in the missions Octoling Assault and Unavoidable Flying Object respectively, with the night version also appearing during Splatfests. As seen from the UFO at the end of the Octo Valley mission Unavoidable Flying Object and by Super Jumping, there are basketball courts near Blackbelly Skatepark. The internal codename for this stage in the game files is "SkatePark". This is the smallest stage in Splatoon, but in Splatoon 2, it is the fifth largest, not counting any Shifty Station layouts. Blackbelly Skatepark is the only stage to appear in both games that has not seen Rainmaker in rotation for the longest amount of time due to its old layout, which allowed rainmaker carriers to easily get a knockout within the first minute of a match. Blackbelly Skatepark is derived from the nouns Blackbelly and Skatepark, Blackbelly is a real-life fish called blackbelly skate, a species of ray and Skatepark is a park for skateboarding. Bバスパーク B Basu Pāku is derived from B. bass park, black bass is a fish and Skatepark is a park for skateboarding. Skeyt-park «Skat» Stingray skatepark. Скат skat also means "ramp."